Pricing for this model is not available online. Bring the standard-setting design and worry-free performance of Sub-Zero to your outdoor kitchen. With the Sub-Zero 24" outdoor refrigerator drawers, advanced food preservation features keep fresh food and beverages at your finger tips. Our outdoor drawers, paired with outdoor panels, have been engineered for temperatures up to 110(degree)F and clad in heavy-gauge stainless steel that withstands UV rays, salt, and moisture - elements that would corrode lesser materials. The outdoor refrigerator drawers hold 4 cu. ft. of food, and keeps it fresher with smart-touch technology that lets you control temperatures from 34(degree)F to 45(degree)F. Organization is easy, with adjustable (and removable) dividers that allow you to separate fresh foods, beverages, snacks and more. Soft-on LED lighting offers controllable degrees of brightness. Sized and designed to fit beautifully into any outdoor space. Drawers are sealed to maintain temperature and lock-in moisture, an ideal low-temp, high-humidity environment for maximum freshness. Engineered for temperatures up to 43(degree) C with heavy-gauge stainless steel panels available that withstand UV rays, salt, and moisture - elements that would corrode lesser materials. The interactive and easy-to-use controls employ touchscreen technology to precisely regulate temperatures and give you more access to more settings. The control panel's small footprint further refines the interior. This feature, commonly found on high-end cabinetry, gives Sub-Zero integrated refrigeration line-up a rich, sturdy feel and noiseless operation. Energy-efficient LEDs offer varying degrees of brightness, enabling you to customize preferences by controlling intensity levels. Every component of every single Sub-Zero unit is tested in its U.S. manufacturing facilities before assembly, then every completed product is factory-tested for up to 24 hours before shipping. In its labs, components are subjected to electric jolts, violent vibrations and 350 temperature swings, and tested to stand up to at least 20 years of heavy use. With over 70 years of innovation, Sub-Zero is an industry leader in terms of refrigeration technology. 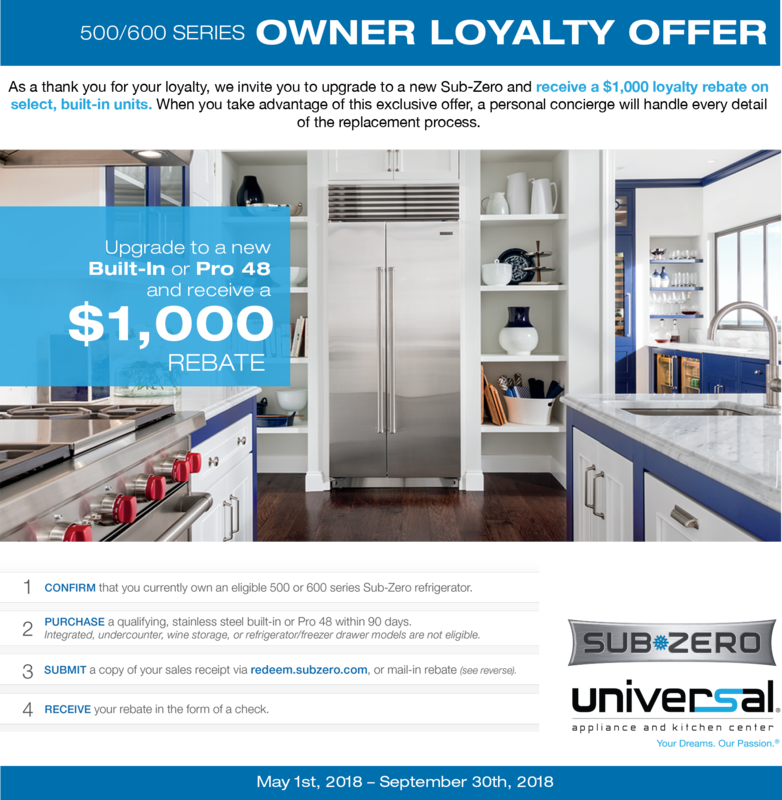 Sub-Zero boasts that it is here to help you “preserve what matters,” and specializes in appliances that keep your food and beverages cold and perfectly preserved. The company manufactures a wide range of indoor refrigerators and outdoor refrigerators, as well as freezers and ice makers. Sub-Zero also manufactures a range of specialty refrigerators including wine coolers, beverage centers, refrigerated drawers and more. Sub-Zero understands that food is a lot more than just food. Meals create community and bring people together. Sub-Zero’s refrigerators and freezers ensure that your ingredients stay as fresh as possible, helping you create truly memorable meals. For a versatile appliance, consider one of Sub-Zero’s freestanding refrigerators or freezers. Or for a more streamlined look in your cooking space, install a built-in model. Regardless of what you decide, Sub-Zero’s appliances come in a variety of sizes, styles, and designs, providing unprecedented luxury in a wide range of options. For premium refrigeration in an impressive design, consider Sub-Zero. Universal Appliance and Kitchen Center boasts a great range of Sub-Zero refrigerators and freezers, providing the storage space your kitchen needs. Be sure to browse our selection of refrigeration appliances today. Click here to download the ID-24RO Quick Reference Guide for this item. Click here to download the Subzero Design Guide for this item. Click here to download the ID-24R Energy Guide for this item. Click here to download the Integrated UCG for this item. Click here to download the Integrated Install for this item. Click here to download the Sub-Zero Sabbath Mode Guide for this item. Download the rebate form. Receive up to a $1,000 rebate when adding a Wolf Outdoor Grill to your Sub-Zero and Wolf Kitchen Package.